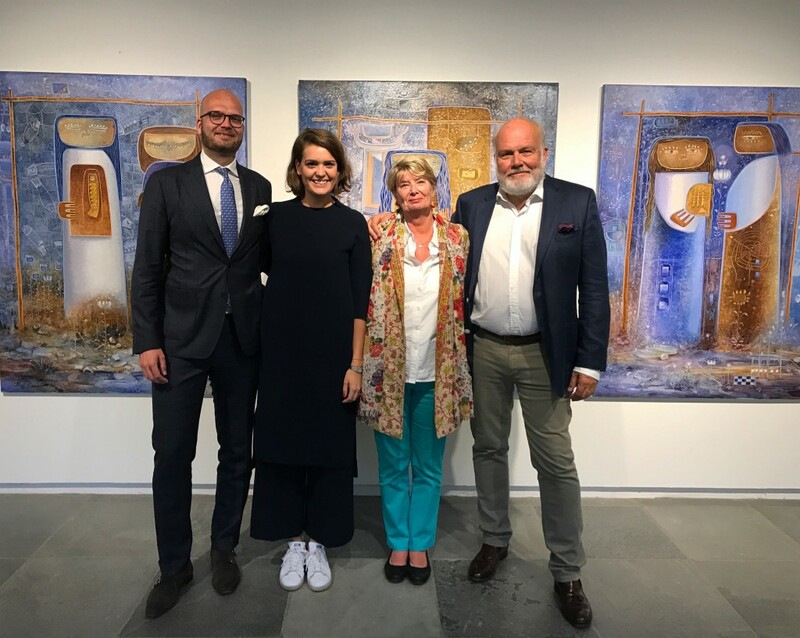 The Olssons got hooked by art and starting collecting when they were travelling in the United States and met Artists Peter Mackie and Elba Damast. In the early 80s, Ulla left her insurance career and started to devote herself to the Olsson Art Collection – and has done so ever since. Greger continued to travel and consult the world and devoted himself full time as well to the Art Collecting world in 2003. Now, their Collection is to be found at the Farm which is a purpose-built conversion of an old farm, originally from the mid 19th Century, located in the most southern part of Sweden. 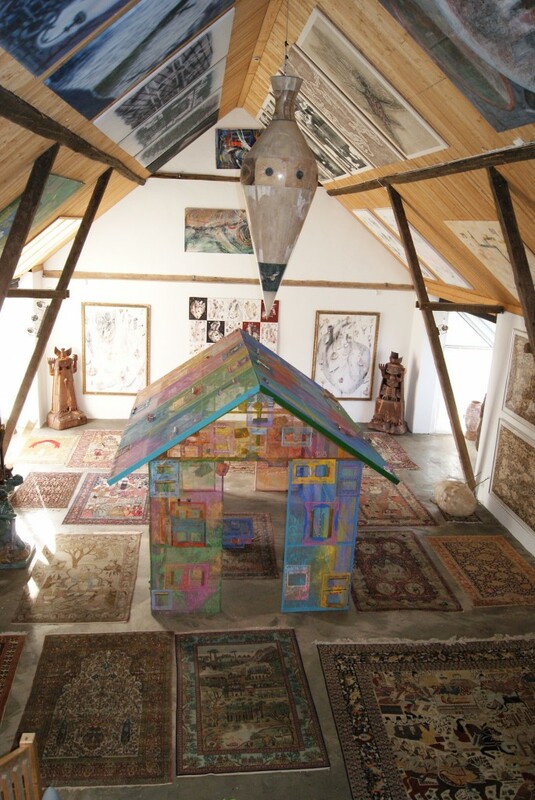 Ulla and Greger Olsson shared with Larry’s List how they got so attracted by Latin American art, how they transformed the old farm to their collection space, as well as the three emerging Latin American artists to go on our watch list. The Olsson family. Courtesy of the Olssons. How did you start collecting art? I am not quite sure. It probably stems from the fact that I wanted to have a unique home that I had created myself and that would provide me with both a calm and a spark (challenge) to live in. I started buying art as soon as I got my first job after university and already from the beginning I was more interested in art objects than in furniture and ordinary decoration. What is the main motivation behind your collecting? I wanted my home to be different and original and thereby have a special kind of quality and uniqueness. This was achieved by collecting, representing and displaying a variety of artworks all around. 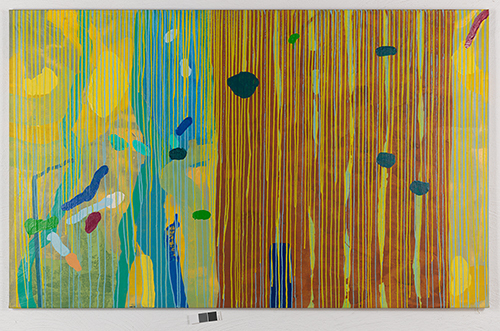 Peter Mackie, “Krinkles”, acrylic on canvas, 1978, 95 x 125 cm, the first painting to the Collection, see Question 8. Courtesy of The Olsson Art Collection. How did you develop your interest in Latin American Art more specifically? The actual Collection started when we specifically got interested in Latin American art, which happened more by accident during our first trip to New York. In 1978, we purchased a painting by American artist Peter Mackie at a gallery. By our following visit, we had located the artist who lived and worked in an artist loft in Manhattan together with his Venezuelan wife Elba Damast. Peter and Elba had a large studio where they rented out space mainly to other Latin American artists visiting New York from their home countries. Ulla and I started to collect works by Peter and Elba, and they then graciously helped and guided us into the Latin American art world. With the help of Peter and Elba, we could master a process of finding new artists over time, and our reputation as collectors grew and made it easier to find and keep new artists. Having that seal of approval and quality through word of mouth, seeing the art and the artists in their natural environment, engaging with them in conversation, that became our modus operandi for collecting. What is your focus regarding the artists in your collection? Is there any particular type of art that has consistently attracted you, or anything that unites all the works you have acquired? A major focus has been to have a Collection that is a representation of the different stages in the “art life” of our core artists. This means that we need to have a working relationship with the artists and constantly be updated in regards to their whereabouts. We have also found that following and buying an artist over time constantly makes us look on both new and old works at the same time and thus keep the Collection alert. If the artist is interesting enough (in our opinion and taste), there is an interplay that constantly seems to make the works look better and stronger. 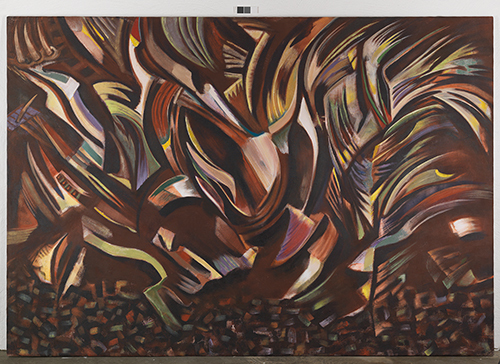 Elba Damast, “Hiridaya I”, Mixed media on canvas, 1996, 210 x 150 cm. Courtesy of The Olsson Art Collection. What other art do you collect besides Latin American art? We also have a Collection of international art. This is a diverse Collection governed by our personal taste and preference and what we have been able to acquire. This part of collecting was easier before everything came online on the internet. 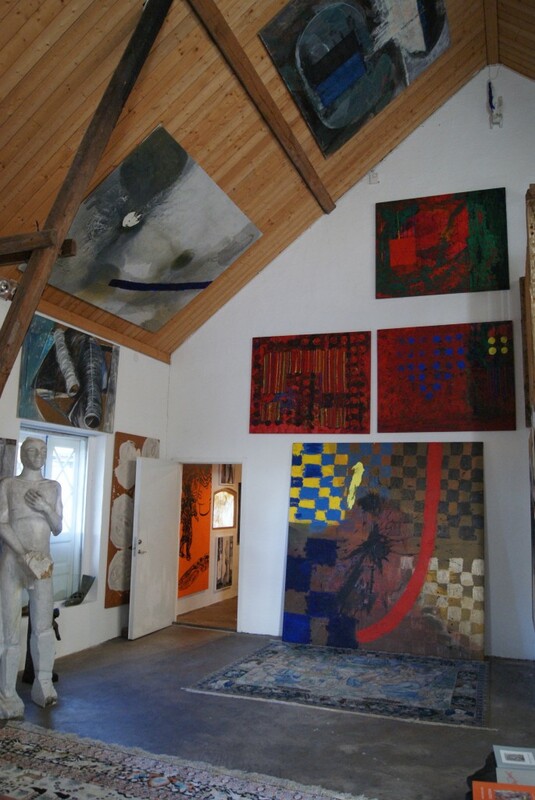 Thus, some years ago, we managed to buy a number of works in the auctions after the big Swedish collector Fredrik Roos. That is, for example, how the Pictures Generations Troy Brauntuch and Pattern and Decorations Robert Kushner ended up in the Collection with each a handful of interesting works! We also have some other Collections we keep alive, which we are very keen on. The biggest (some 100 carpets) being the Collection of pictorial carpets. We also have an interest in African art, Pre-Columbian art, Mexican silver and Swedish glass. All these objects and interest have developed through museum visits, reading in our art library and 30 years of subscribing to some of the major art lover magazines. From a presentational point of view, the juxtaposition of contemporary art and non-Western works could intend to provoke reflection on the form, status, and function attributed to art objects of any origin, whether from the West or elsewhere – interesting when you are just sitting there or walking around. 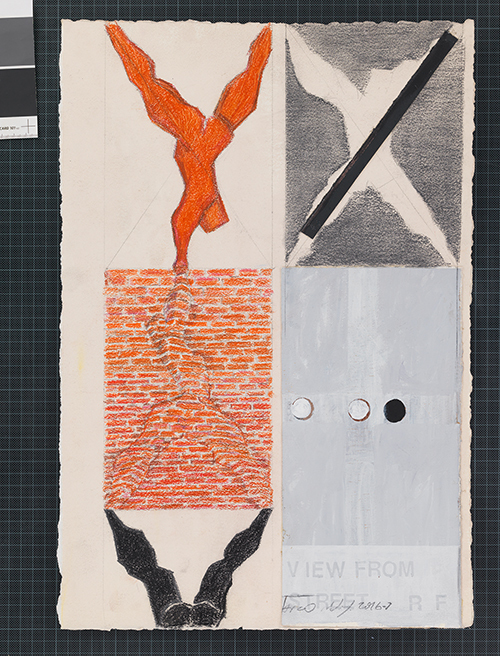 Raul Farco, “View from Street”, Mixed media on paper, 2017, 80 x 34 cm, the last drawing bought, see Question 8. Courtesy of The Olsson Art Collection. How is collecting art nowadays different from 30 years ago? Collecting nowadays has changed, and it is more of everything and everything seems to move much faster. Tendencies like zombieart and crapstraction sometimes seem to rule the game. Mass production and factory fabrication have turned artists into more of designers. There is an abundance of information everywhere, and it has become harder to filter what really is of interest to you as a collector. In my personal opinion, I struggle in finding relevant information and fora, especially online, that really interests me. As a result, I am simply not that engaged anymore. I need to find more channels to broaden my scope of interests and engagement. Maybe finding like-minded collectors could be a way. I probably, after all, also need to see more art and meet new artists who challenge me. What was the first and the latest artwork you purchased? 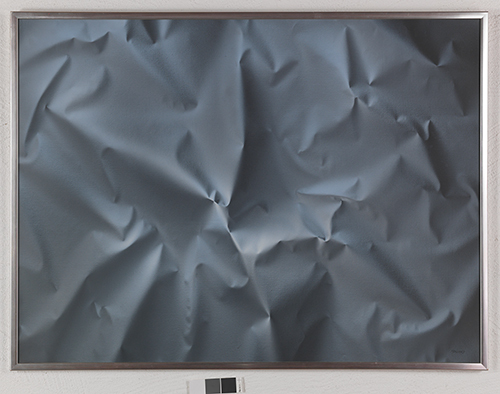 The first artwork that really started the collection is a painting by American Peter Mackie, grey crinkles in airbrush technique (long before and much better that Auerbach – and not a million dollars!). The last works were some 10 drawings by Argentinian Raul Farco – one of our absolute favourites. How many artworks do you own? Have you ever presented your art collection publicly? We haven’t counted the number of works we own, but the total must be well above one thousand. Yes, we have shown the Collection, or rather parts of the Collection publicly on several occasions, for example, last time summer 2017 at Landskrona Konsthall (located in the southern part of Sweden). The show was accompanied by a catalogue on all the exhibited works. “The Church”, the largest room in the Farm. Courtesy of The Olsson Art Collection. You converted an old farm to display your collection in the Farm. How did you come up with this idea? When we moved back from Brussels to Sweden in 1999, we needed a big place where we could have and expose the Collection. One absolute requirement was that such a place should also enable us to live there at the same time. We started looking around and happened to find the Farm, which already had the wanted space, which at that time was a gallery and a restaurant. We converted the restaurant part to private quarters and revamped the gallery part and added a big garage for the old Mercedes convertible and extra storage – and we have the Farm as it is today. Being able to live with and amongst the Collection is an absolute must for us! How important is it for you to meet the artists who created the artwork? Knowing the Artists is very important – and I think – a necessary part of being a Collector. The knowing of and being together with the artist is part of building and educating you as a Collector. The more you know the artist and of his/her work, the more you can understand it and thereby, hopefully, enjoy and appreciate it. Also, it is easier to work with and support the artist if you have a personal relationship. We have made sure over all the years to meet with our artists frequently. It has been very important for the Collection and its continuity that our daughter Emma, the only family member with a university degree in art, has devoted more than five years full time to work with the Collection and our artists, most of that time also spent living on location with the artists in Argentina, Costa Rica and New York. What is your advice to young and fresh collectors? I am not a consultant anymore, those days are gone. For my own kids, I simply brought along wherever I went and exposed them to whatever I did. They turned out OK. The cliché here is following your heart – but educate it first! What was your happiest moment being involved in art? I would not single out one such moment. Just walking around at the Farm, sitting here and there watching, thinking and remembering is a constant joy, an endless happiest moment. Here I have what has become my life and a Collection that I have created all by myself with my wife Ulla. Add small things to that – music, wine, family and simply being still in the moment – what more can you ask for? As you probably can see from the interview so far – it is both a passion and obsession, but also a necessity. With the collecting comes the whole lifestyle; family, travels, library and home. 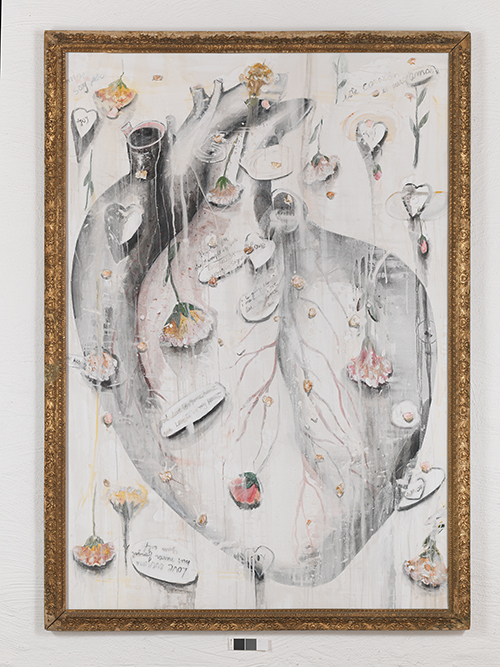 Gladys Triana, “The Ritual”, acrylic on linen, 1991, 205 x 298 cm. Courtesy of The Olsson Art Collection. Can you name three emerging Latin American artists who should be on our radar? I can do better. I can give you three older Latin American artists you simply have to see and get to know. They have all devoted their whole lives to art, especially their own art, and if they could have had the right backing gallery, say Gagosian, they would definitely be world-known names now! They really are that good! Elba Damast (1944 – 2005). Our first love! Born in rural Venezuela, educated in Paris and working in New York all her life. Another overlooked female artist whose oeuvre is very personal, vivid and technically advanced. We love her work. Gladys Triana. She is a Cuban artist (born 1934) and has lived in New York City since 1975. She is working across a variety of mediums including painting, drawing, collages, photography, and installations. She has found ways of using her work to rebel against society’s stereotyping of women and limiting their freedom of expression. An extraordinary artist and woman! Raul Farco (born 1954). Argentinian sculptor with complicated and technical sculptures – no “factory” work here! His output is low – he only follows his own ways; he has an interesting way of being stubborn. And what sculptures! Fabio Herrera, “Yellow Rain”, acrylic on canvas, 2005. Courtesy of The Olsson Art Collection.